First of all, I want to say that I am generally into religiously themed comics. They generally, probably should offend me. But they usually don’t. Why? BECAUSE THEY ARE JUST COMICS, PEOPLE! But Thor is different, because of how close much of the language comes to the actual way in which I personally worship God. There are times in the “Godbutcher / Godbomb” story where I got pretty close to offended. Close. But then I remembered. IT”S ONLY COMICS! That pre-qualifier said. That disclaimer delivered. On with my thoughts. I started reading “Godbutcher” when Marvel said. “Ok. DC has the New 52 and the Joker chopped off his face and he’s back now. IDW is scoring zillions of ratings points with the nerds. We need to reboot. Or at least look like we are.” So they started their Marvel NOW! campaign to get our attention, killed Peter Parker. Oh yeah. On the sidelines, Thor got a new book. Thor, God of Thunder. With a title like that, we expect to get to know Thor, and how he thinks, and why. AND we expect to learn a lot about his history and stuff like that. “Godbutcher” begins with young viking god Thor finding a god’s head washing up on the shore, a native American god at that. It continues with with Thor the Avenger of the present day finding a civilization that has no gods. Shocking. Upon investigating, he finds the planet’s gods all murdered and dismembered. Their “godflesh” rotting slowly. This scene should now terrify us. Gods are supposed to be immortal! But here we see that someone can kill them. Something attacks the avenger…A Black Berserker. It isn’t long before we know it is Gorr the Godbutcher who is slaying gods…And we see future Old Man Thor, the All-Father beaten into hopelessness by Gorr. I like the way the story goes from young Viking Thor, who uses an axe instead of a hammer, Thor the Avenger, the one that we know best, and future Thor, Odin’s replacement. This was a grand way of showing us who Thor was, is, and will be, if not confusing at times. It also shows us that this story could have been revealed VERY slowly. Over an entire title run. But the writers showed us this grand story the way they did in a masterful way that makes sense if you are a persistent reader. As the story of the Godbutcher goes on, we see old man Thor defeated over and over by Gorr’s minions. Thor is the final god, saved for Gorr to kill last. In the young Thor and Avenger Thor’s stories, we see how Thor is the one that got away from the killer. This is why he toys with Thor as an old man. This villain, Gorr, is a truly evil killer. His weapon channels black energy into it’s target. It works similarly to a Green Lantern ring in DC or the Symbiote costume for Venom…creating constructs that allow him to fly, makes swords, ropes, and whips, and more. And when a god is attacked with the weapon, it takes something from them. Also, the Black Berserkers are constructs of this weapon. So we see (As Thor remarks in book 2,) Gorr has grown very powerful. Speaking of Book 2, we get our first taste of combat between Gorr and Thor. The young Thor utterly loses. I like the dialogue. Gorr says, basically “What are you the god of…poetry?” Thor just says “Thunder,” and a bolt of lighting hits Gorr! Book 3 is cool because we see Avenger Thor bringing up his guilt complex. He tells Iron Man that he feels guilty because he did not kill Gorr one thousand years earlier. And that summarizes it, pretty much. Thor sees many more dead gods from different worlds. This story gets more convoluted, as the three different aged Thors are having similar thoughts, and the panels switch one to another quite a bit. Oh. And book 3. Old King Thor is still getting beaten up. Book four is where I start to get a little offended. Just a little. Old King Thor sits on his throne, last of all gods. In other words, the only god left. He talks about how he has seen everyone and everything he loved killed. He is surrounded by those Black Berserkers. And he seems so powerless and hopeless. The language here is nihilistic. “Gorr won’t just let me die…” etc. The idea of one god being powerless, is abhorrent to me. Then I remember. IT’S JUST COMICS. And we could have seen where this was going. To somewhere that time-travel can take place. Chronux, city of the time gods. Essentially, from this point we see Gorr’s plan coming together. I think I have it figured out…Then I don’t. Gorr goes back in time to the early universe, where he sees a baby god sitting and making beings out of clay. We assume this is a god from Gorr’s own pantheon…He kills this god. My thought was, “He’s killing all gods by killing this one.” But nope. That would be too simple I suppose. Gor brings back the giant gods heart…He is going to use it as the core of a weapon that will kill all gods at all times. Along the way, during the time-travel part of this adventure, Avenger Thor manages to rescue Old Man Thor. The two of them fail to stop Gorr. Issue six was a break from the larger story…a telling of Gorr’s origin. Basically, Gorr came to curse the gods his people were devoted to. His world was dry as a bone, and people were suffering. His family was all killed off, and offerings, prayers, etc to their gods resulted in nothing. Finally, as Gorr begins blaspheming, he is exiled. In his banishment, he sees two gods in battle. They nearly kill one another. The “good guy” god begs for Gorr to help him. Instead, he steals the “bad guy’s” weapon and kills him. This is the origin of Gorr and his weapon, which we learn later is called “The Anihilablade.” This issue introduces us to Gorr’s son as well, leaving us scratching our heads…. When I set out to read these stories, I thought they would be a smaller story arc. Instead, it looks like Marvel roped us into eleven issues total. Luckily, I enjoyed the book. Unluckily it seemed that this book had an inconsistent release schedule. It was like issue after issue came at once, then there was a lull of like six weeks…. The second part of the story is called “Godbomb.” With the ability to control time, Gorr has gathered gods from all corners of the universe and kept them as slaves to build a bomb that will make their “species” extinct all through the ages of time. Gorr is making himself into a god, styled after the gods that drove him to become what he is. But he refuses to admit this to himself. He also does other things, including giving the slaves the seventh day off, and crucifying gods who try to rebel. (Here is some of where I got offended. ITS JUST COMICS. Whew. Got that over.) Viking Thor is among these slave gods, and when he arrives on the planet where the bomb is being built, right away he takes action and manages to escape and meet up with the other two Thors. This story moves a little faster than the first arc, because we are not jumping around in time. All three Thors are on the same timeline. Which is what it would take to bring down Gorr and his plan. We also see that the Black Bersekers are now a mighty army, and Gorr not only has a son, but also a wife. These two are hopeful that Gorr’s dream of a godless universe will come about. What happens basically is that the Thor’s fail. The bomb explodes, killing ages of gods, past present, and future. But…Thor the Avenger takes a last desperate breath, grabs his future hammer, and goes into the exploding bomb, absorbing the blast into both Mjolnir hammers. In doing so, he also steals Gorr’s weapon. We find out that Gorr’s wife and child were just constructs as well. And then Viking Thor chops off his head. I also like the follow up one-shot. 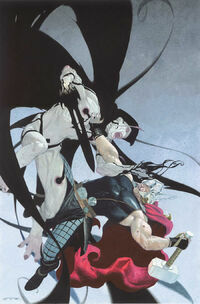 Issue 12 shows the three Thor’s returning to their proper time, forgetting all about their future adventure. Thor is seen as an evolution of Western religion. His barbarian self represents what gods were like in early pagan times. His Avenger self represents the active and visible religions of the world. (I like how issue 12 portrays Thor!) Then the All-Father Thor represents that far off and untouchable-ness people often sense from God. So Thor and Gorr are philosophical opposites. And in the end, Gorr had no hope. All of his hope was in himself and his efforts. And religion won out, living it’s legacy after the god butchers was more or less erased from history…. I rate this story arc as a 4/5. I took a point because the story starts to ramble a bit. I wish it were one of two things. Either a story spread over a 100 issue series, or a lot shorter…Maybe only six books long. Instead, we got eleven books and a twelfth book chaser. Think. This is a YEAR WORTH OF READING. But it kept me interested. I kept buying. The high idea of the story, Humanism vs Religion as a slasher story, was very entertaining. The art has its own style, and I am glad to see that Marvel is still printing letters at the back of almost every book. Posted in Godbomb, Godbutcher, Gorr the Godbutcher, Green Lantern, IDW, Marvel NOW, New 52, Spider-Man, Thor God of Thunder.